The Dixon’s product line includes VirGIN, named Best Canadian Gin at the 2017 World Gin Awards, and the GinFusion cooler, now available at LCBO stores across Ontario. 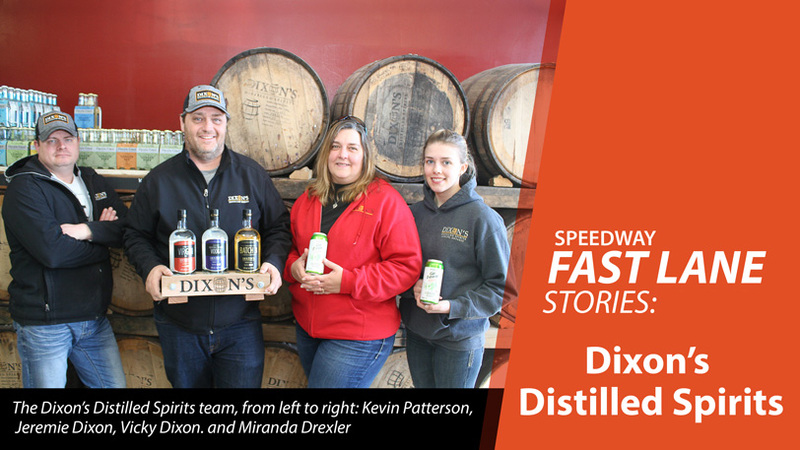 With warmer weather and the patio cocktail season just around the corner, business is bubbling over at Dixon’s Distilled Spirits. 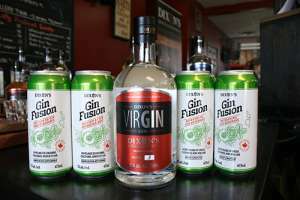 Guelph’s first craft distillery is raising its game with help from Innovation Guelph (IG) in anticipation of a major bump in sales this spring, when Dixon’s GinFusion beverage hits LCBO stores. “This is a huge opportunity for us. I’m excited about the possibilities and proud of what we’ve achieved to get to this point,” says Jeremie (JD) Dixon, who co-founded the business in 2013 with his wife Vicky and longtime friend Kevin (Chevy) Patterson. Dixon’s Distilled Spirits uses Ontario-grown grain to produce hand-crafted gin, vodka and whisky products that have been winning over consumers with a taste for artisanal, small-batch spirits. GinFusion — a gin cooler naturally flavoured with ginger, cucumber, mint and lime — was recently selected for a full listing by the LCBO and will be on store shelves across Ontario in April. It joins Dixon’s Silvercreek Vodka, now available at select LCBO outlets. 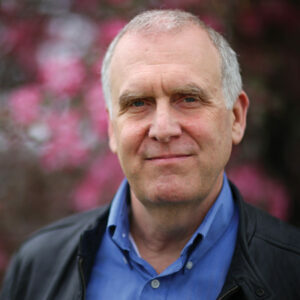 Dixon spent months developing a business plan before telling anyone about the idea. Then after a night of socializing and strategizing on their backyard deck, Patterson came on board as a co-owner and in 2014 the company moved into its premises on Elmira Road. Over the course of the next year, the partners — who still had other full-time careers — worked many late nights and weekends getting the space ready and assembling most of the distillery equipment themselves. That’s quite an achievement considering that, apart from some courses in Chicago and Louisville, Ky., none of them had any experience with distilling or brewing before launching their new enterprise. But they were intrigued by the opportunity to get out in front of a burgeoning industry — despite the potential barriers to success in a tightly regulated, heavily taxed sector. Although the journey has taken some unexpected turns, Dixon says he got into the business with “eyes wide open” about the hurdles, including the licensing requirements of the federal and provincial governments. Craft distillers face a much more complex system of regulations and taxes than small-batch brewers and winemakers. In fact, Ontario’s dozen or so operating craft distilleries must contend with the same regulatory and tax structure as the makers of global brands like Bacardi or Smirnoff. “Things are changing but it’s a slow, complicated process,” says Dixon, who took a long look before leaping. 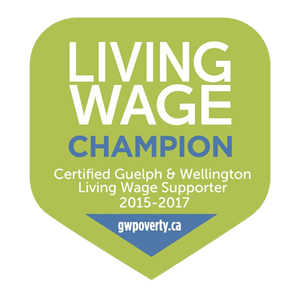 Looking for guidance to keep them on the right path, Dixon’s approached Innovation Guelph in early 2016. One of the first priorities was developing a shareholders’ agreement for the company. “It’s a fundamental building block when you have more than one shareholder. It lays out the way you’re going to do business together. It’s also a bit like a prenup agreement in case things go wrong and you have to take it apart,” says IG mentor Steve Barrett. The next step was to focus on a strategy for generating and sustaining revenue while working toward getting product(s) listed by the LCBO. “When you’re only able to make a submission to the LCBO once a year, what do you do between the annual submissions? How do you generate awareness and revenue so you can sustain the business?” says Barrett, who praises the “enormously energetic” Dixon’s team for getting to this point. That listing for GinFusion is a game-changer that brings opportunities and challenges that will transform the business significantly. The company has been working with Barrett through IG’s Fast Lane program to help manage that transition. “We’ve sketched out an approach that will provide them with the tools they need to make key growth decisions going forward: how fast do they grow? When do they add capacity? Which are the best markets for them and how do they cut the deals to expand into those markets? It’s the multitude of management decisions that start to happen once you get some traction with the business,” Barrett says. To do that, Dixon’s has looked at all aspects of their operations. They’ve trimmed their product line to make more efficient use of the spirits they produce, and modified their processes to cut water use by two-thirds. It seems that people who know gin would agree. Dixon’s virGin was recently selected as the best Canadian gin at the 2017 World Gin Awards. But don’t expect the Dixon’s team to rest on their laurels. The company recently closed distribution deals for GinFusion in Alberta and B.C. and hopes to crack the U.K. and U.S. markets in the near future. “I’m not done. I’m happy, but I’m also hungry,” says Dixon.